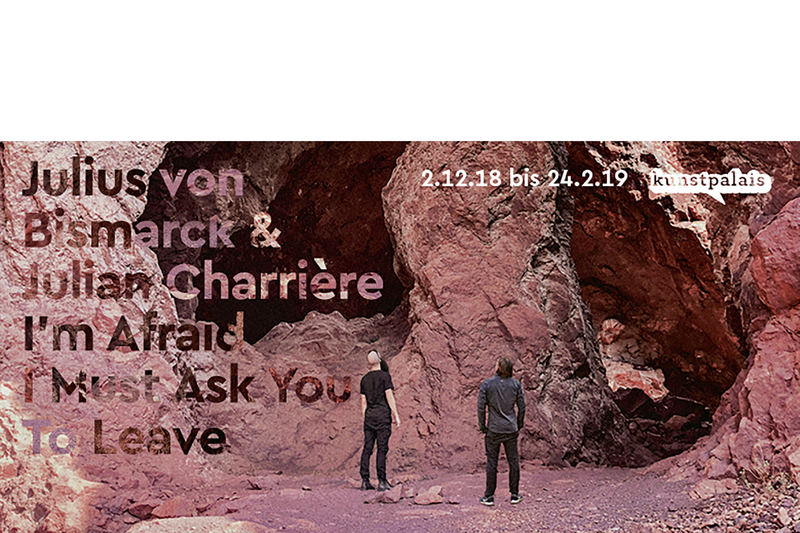 Julian Charrière and Julius von Bismarck are each outstanding artists. They are best friends. And sometimes they are partners in their artistic work. The first major exhibition of these two as a duo will take place at the end of 2018 in the Kunstpalais. Despite the diversity and autonomy of their works, they are united in their claim to initiate an intensive reflection about our relationship to nature and our place in society through their art. Both work at the interface of art and science. Julian Charrière (* 1987 in Morges, Switzerland) is fascinated by geology and archeology. These however, are not perceived as backward-looking by him: with his works he analyzes the present – and dives deep into the earth. For his large installation at the Venice Biennale 2017 he extracted sediments from the Bolivian salt desert Salar de Uyuni and thus creating a salt-pinned landscape. With these excavations in the salt desert Charrière anticipates excavations at the same site of much greater extent, given that the salt desert is also the world’s largest lithium deposit. And lithium is becoming gradually the most important resource in the digital world. Therefore Charrières Future Fossil Spaces are future archaeologies. Julius von Bismarck (* 1983 in Breisach am Rhein), who like Julian Charrière was a student of Olafur Eliasson, describes himself as a wannabe physicist. Movement, especially in circles, characterizes many of his works. For the Art Basel Unlimited 2015 for example he created an Egocentric system: he set himself up on a parabolic turntable with a mattress, a desk, a laptop and food and spent the entire duration of the fair in this room in constant motion under the influence of gravity and centrifugal force. With other works, such as the video Irma To Come In Earnest on the hurricane in Florida, he discusses our dealings with nature and climate change. As an artist, Bismarck regards it as his social responsibility to raise awareness of current topics and problems. In his work series Punishment he did this, for example, by personally whipping legendary places such as the Alps. When both artists work together, artworks emerge that are equally scientific, sensual, curious, auratic, sophisticated, humorous, and, in the best sense of the word, megalomaniacal.